I had the real pleasure of meeting one of the greatest living British photographers recently; John Blakemore. Not only did I get to meet him, but I was able to spend two days with him, listening and learning from the master. That said, I did have to share him with nine others, all as part of a weekend workshop organised by the Redeye Network covering book binding and sequencing. Before I go on and cover anymore in the article I should mention I went to the workshop with no intention to do a write up afterwards and as every minute found me fully engaged in the workshop, the images I have included here are just random sketches I took on my phone for future reference – so not great quality but hopefully ok enough to serve the purpose. I first considered attending such a workshop about 2 years ago now, driven by a number of factors. I had started to think more seriously about what I wanted to do with my images and having completed a number of small, personal, book based projects as well as a commissioned one (all completed through online publishing) and then finishing off a recent photography project, my thoughts turned to book making by hand. So I started to do a little research online and came across a workshop led by John being offered through Redeye. Initial attempts to book myself on a workshop were initially thwarted by my tardiness in booking, with workshops selling out within 24 hours of being announced. Even the course I did eventually attend at the Manchester Art Gallery in March was sold out but I put myself down for the waiting list and fortunately for me someone must have cancelled as a place become available which I duly took up. My thought process for trying my hand at book making really stems from my belief that photographs are best presented in printed form; print or book. As such I tend to try and print as much of my work as possible, preferring to do that even before putting the image out for public viewing; you learn so much about your images by preparing them for print. Much of my work printed work doesn’t get a public airing at the moment and rather than simply fill boxes with reams of prints - because I don’t have the wall space to hang much of it - producing books is an ideal alternative. The benefit being I can then go on and ‘commercialise’ any of them if I felt I wanted to do. Of course I could have just continued to go down the online book publishing route, you can put together some nice books that way and I am sure I still will do occasionally, but I wanted to explore other presentation methods not available that way. That really only left working with a commercial setup, which is entirely impractical for a handful of books, or DIY. Indeed as I developed my early handmade book attempts - now in the bin - it became apparent I could actually do both; create a handmade book and then work with a professional team to turn that into a commercial offering. An approach I cam currently taking with my book project – The floods (which for those that have been following my progress may seem like an eternity!). This made the timing of the workshop I eventually did get to attend ideal. I had already started to work through a few ideas myself and could go to the workshop with a clear sense of what I wanted to achieve from it. The major aspect I was to focus on was the sequencing element; bringing together a set of images that worked as a whole. Whilst a lot of my photography is now project and sometimes theme based, simply stringing them together as a chronological set of images doesn’t necessarily suit the project brief and does not necessarily result in a satisfying viewing experience – although as John mentioned, don’t assume your readers won’t start from the back of the book. How many times have you picked a book up and started flicking through backwards?!? I won't say a great deal about John as a person, only that he is incredibly generous with his knowledge and guidance, matched with a quick wit and kindness; truly a wonderful person. 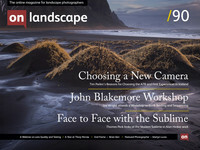 As an artist, much is written on his work – you’ll also find an article here in an early issue of On Landscape written by Tim: issue 11 . A career spanning many years working with mono and colour work, both commercially and personally, John has developed a highly respected body of work spanning a number of photographic genres. Matched with this body of work is his excellence in black and white printing; of which he also leads workshops on and, off course his wonderful book making skills. Whilst he likes to points out he has no formal training in book making, he is clearly a very talented craftsman and visual artist across a number of disciplines and with many years of teaching under his belt, an excellent communicator. The workshop itself ran over a Saturday and Sunday with fairly leisurely start and finish times but with ‘homework’ on the first night for those that wanted to make the most of the second day. Attended by a total of ten individuals from broadly varying backgrounds and skill levels made for an interesting weekend. There were also a couple of others in attendance representing Redeye to help with the organisation and smooth running, mostly tasked with keeping a very enthusiastic and absorbed set of attendees on time throughout. If left to our own devices I am sure many of us would have been happy to work away into the small hours! The agenda was structured to provide as much time as practical for the hands on aspects. Starting with an introduction from John and a brief look at a number of the many book style samples he had bought along with him – who knew you could create so many variations on a book with the simplest of tools and materials – my imagination had already gone into overdrive at this stage! He then followed this up with a practical demonstration of creating two basic book styles; an accordion style and as we came to name it: the ‘John’ book – in essence more of a traditional western style book form. As mentioned these were created with the simplest of tools and materials: paper (optionally printed) for pages, coloured paper for end papers, card or board for covers (optionally covered in cloth or paper) and then tool wise; scalpel, bone folder, ruler and triangle, glue, brushes and clips. The first day was then finished off with a discussion on sequencing, with each of us that had bought prints along laying them out for a discussion on the work and importantly, how we had come to sequence it. John made suggestions that were discussed as part of the group that we could take away to think about as homework, to develop the sequencing and where appropriate removal of images from the work in readiness for the actual book making the following day. These are not massive coffee table tomes, rather, very tactile sensory objects that invite you to pick them up and spend time with them. Interestingly and clearly from the experience John has developed with hand making books, the amount of images he tended work with is reasonably small. These are not massive coffee table tomes, rather, very tactile sensory objects that invite you to pick them up and spend time with them. Perhaps it’s the fact that there are only a small number of very carefully considered and selected images that encourages you to linger on each photograph or quite frequently, diptychs or perhaps it is the handmade nature of them with each turn of a page unveiling a secret, lovingly created that makes you do this? Looking across the books he had brought along there looked to be somewhere between 10 and 20 images in each but all intermixed with narrative and white space to allow the work to ‘breathe’ a little with pauses and rhythm of content and narrative. This is not to say he does not produce larger books, apparently he does. In a lot of cases John works with lab printed photographs; 5”x7”, etc, which he adds to books made with blank pages but will also pre-print (ink jet) images to act as pages themselves. A lot of the text in the books is also handwritten, taking quotes from other sources or words of his own. He also works with watercolour papers for the pages and admitted to recently mastering the art of ink jet printing images of different sizes on both sides of paper! I didn’t see any books there where he had darkroom printed himself and used as content, I’m sure he must do though – perhaps whoever next attends one of his workshops would care to ask or ask in advance for him to bring some along? The final observation I will mention is that he builds work up over a number of years, not only with the books but also photographically; repeatedly visiting subject material - a great deal of which is in his own home environment nowadays. He then builds these into a series of books frequently based around the same theme. Again, this clearly contributes to the intimacy of his work and provides connection and personality to the work. The second day was all practical; the book making. Whilst John had demonstrated two simple book styles we were at liberty to try whatever we wished and as a group I think we did literally decide to all take on different formats. John then spent his time helping everyone with the production of their books. There was a real buzz of enthusiasm for the whole day as folks worked away studiously on their books. At times you could feel and hear the concentration, occasionally broken with an excited attendee admiring their new found handiwork or comments of admiration from other attendees. Lunch on the second day was but a necessary inconvenience as we all hurried to get back to our craft tables to get finished before the workshop ended. For myself, I decided based on my A4 sized prints to go with an accordion book style. This actually resulted in me having to trim down my prints and fold them straight down the middle. Feeling quite extreme at the time, it did actually result in a very satisfying and pleasing book to handle and browse. Overall the workshop was well run with great facilities in the craft room we were using, a restaurant on site at the Gallery and, the Redeye team were themselves very attentive. I would certainly recommend this to anyone with either a passing or committed interest in the subject, not least the opportunity to spend quality time with John. The weekend ended all too quickly, certainly for me, with the whole experience being well worth the time, journey and what I thought to be good value compared to others I has seen on a similar subject. I suspect I have come away from the workshop with more than just a few more skills, you can’t meet someone like John and not have a little bit of that experience seep into your psyche!